Pours a thin-looking, nearly headless, clear amber. The smell is mostly cinnamon and nutmeg. Kind of like a spice cookie, but with an off-putting sweetness, like grandma dropped a whole box of Splenda into the batter. The taste is an astringent, unpleasant sack of burnt spice, covering up any theoretical pumpkin. Leaves behind the feeling of a cinnamon challenge-esque tongue residue. 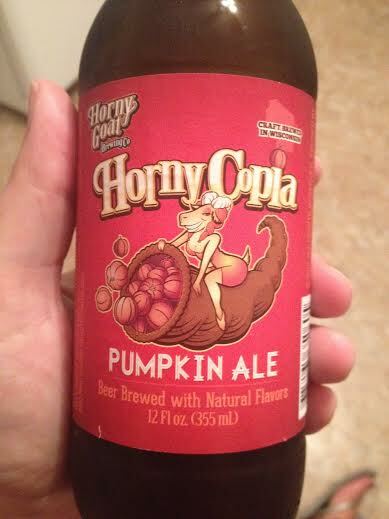 Look, if you don’t want to brew a pumpkin beer, please don’t brew one. No one is forcing you down that avenue at knifepoint. AND, if you don’t brew yet another mediocre at best pumpkin beer, think about how much you are making life a slightly kinder place by withholding the thoughtless swill that you zested a dirty pumpkin into and then bottled for the Fall season. Our current recent offender, Horny Goat, has brewed an ale that for all extenuating purposes, seems passable. It pours a pleasant tangerine-like orange, and smells faintly of caramel with dashes of nutmeg and cinnamon. That’s where the pleasantries end. For a fleeting moment, this ale tastes of burnt nutmeg, meek cinnamon, and caramel malt, but only for a flash of time. It transforms into what essentially tastes like soda water with some corn syrup stirred into it. Almost all taste vanishes, but the phantom presence of beer in your mouth leaves you confused and distraught. Wasn’t there just beer here? It’s like hearing someone insult you, but you can’t decipher the words. You know it happened, but how upset should you be? Sink pour #3 of the pumpkin beer season. 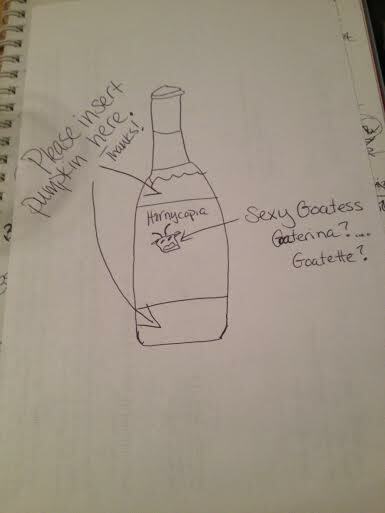 I drew a picture with some helpful recipe suggestions.